This painting was a really fun experimental piece. I thought I would share my creative process since it was a little different from my acrylic painting on canvas. 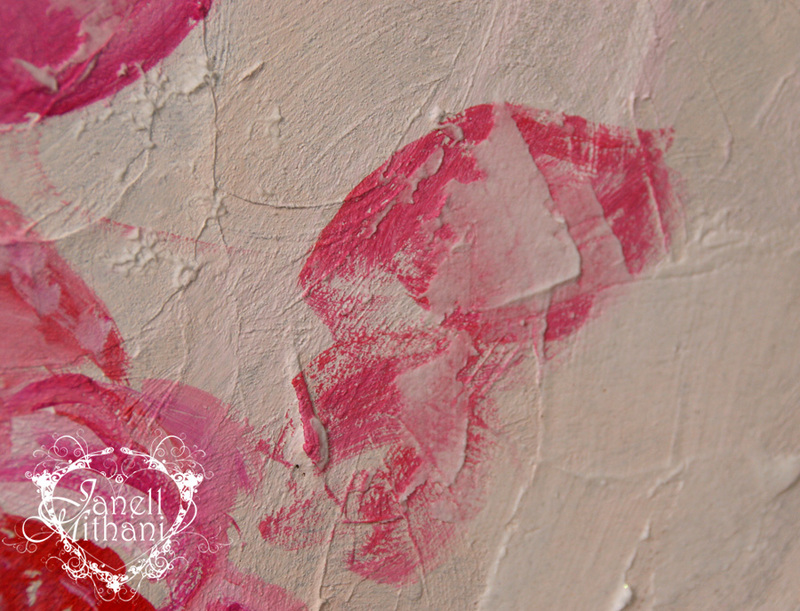 I had picked up some Golden acrylic mediums a while back and I have used the Coarse Molding Paste for a couple of image transfers, but I have been wanting to experiment with adding it to an acrylic painting to build up some textures and shapes. For the first layer, I mixed my acrylic paints with some Golden Acrylic fiber paste and coarse molding paste which created a thick textured paint that I applied to the canvas and then let dry. Then I painted the background over it. 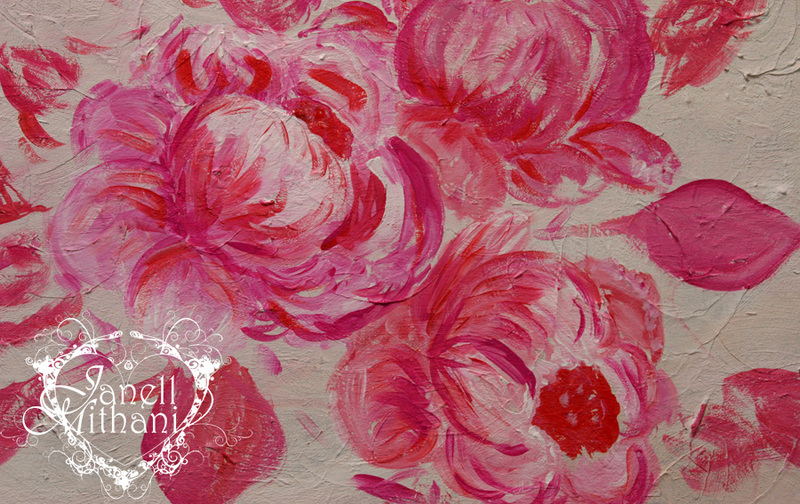 I painted the flowers adding in some medium in some areas to thicken the paint and add even more texture. Tools and supplies… and my very messy art desk. About 1/2 way through the painting I decided to add some more texture by applying the Golden Coarse Molding Paste to a stencil. 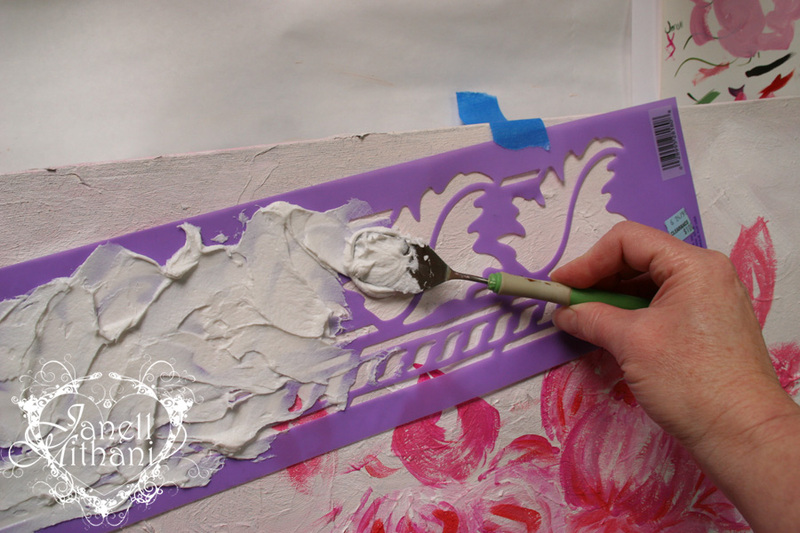 I applied the molding paste without any paint to the stencil. 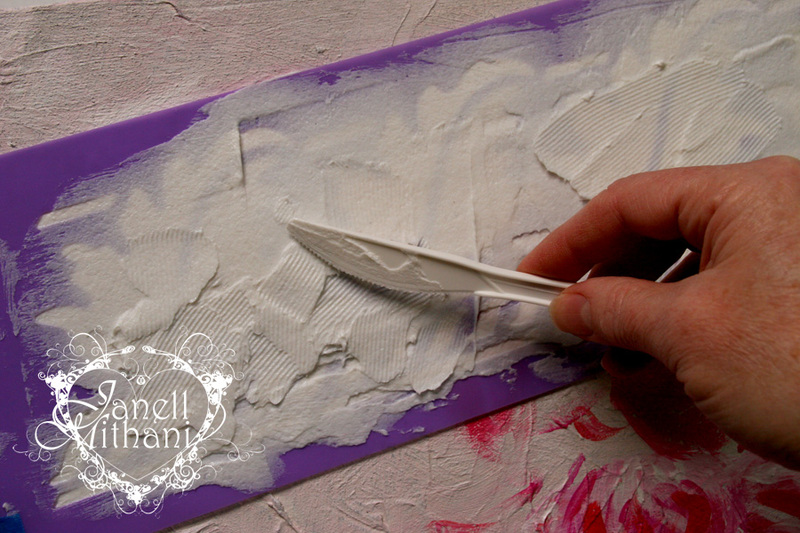 I used my palette knife and a plastic knife to apply the paste to the canvas. Applying medium (generously) over stencil. The plastic knife created an interesting lined texture. 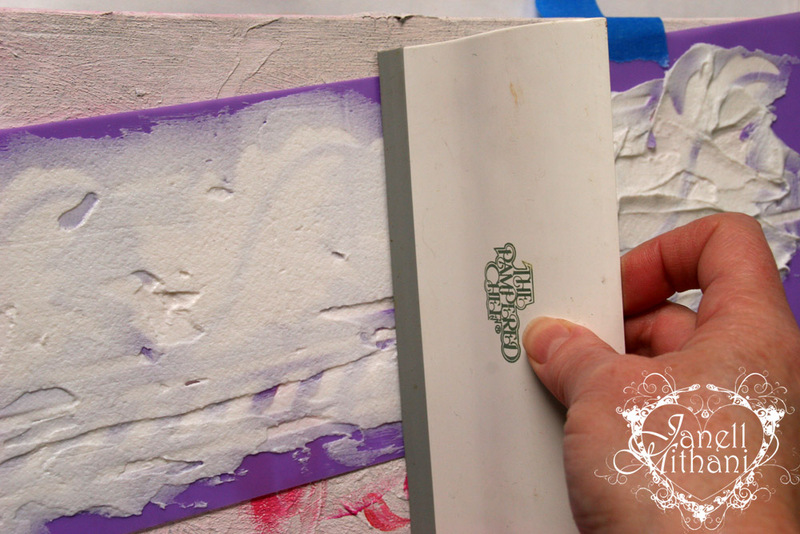 Once I had a lot of medium over the stencil I used my Pampered Chef squeegee (not sure what it is actually called) from my kitchen to get a smooth surface. Then I lifted the stencil off. 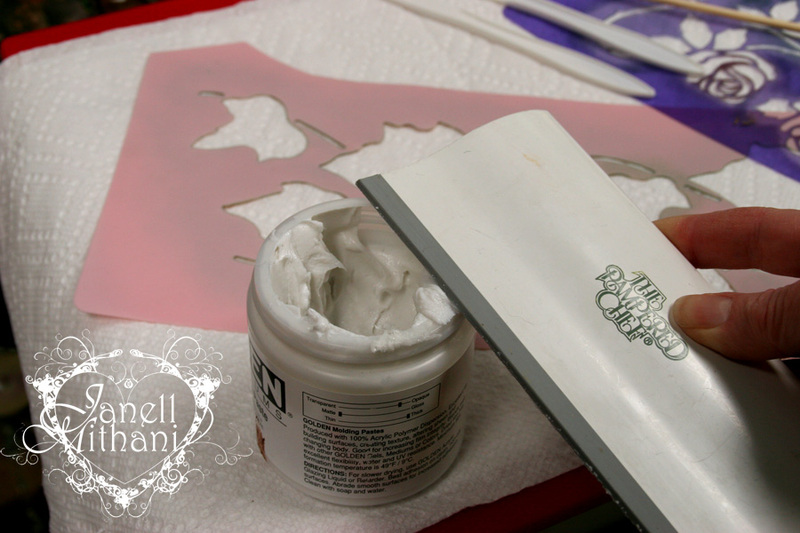 I cleaned the stencil with the squeegee and put the excess paint back into the jar. (Don’t waste any of it!) I finished cleaning the stencil with a wet paper towel and then hung it on my window with painters tape to dry so I can re-use the stencil for other projects. 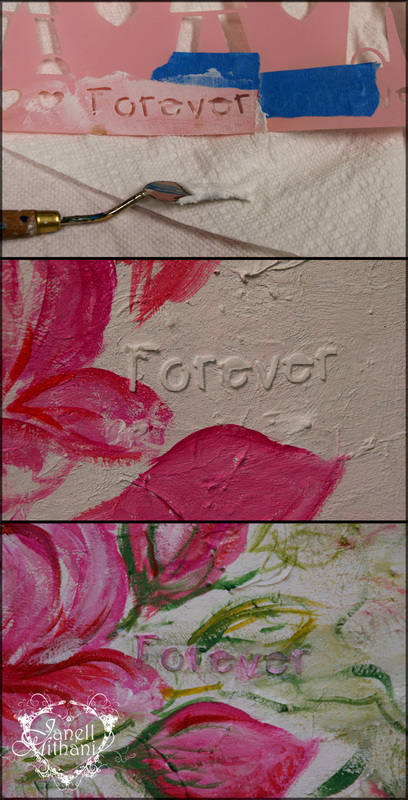 I also used a portion of a stencil to write the word forever. The triple picture below shows the stencil, the dried paste and then a detail of the finished painting with paint over the top. I also applied some of the Acrylic Coarse Medium over the paint in some areas as well as mixed it with the paint to add more texture to the flowers as I painted in more details. Golden molding paste over painted canvas. 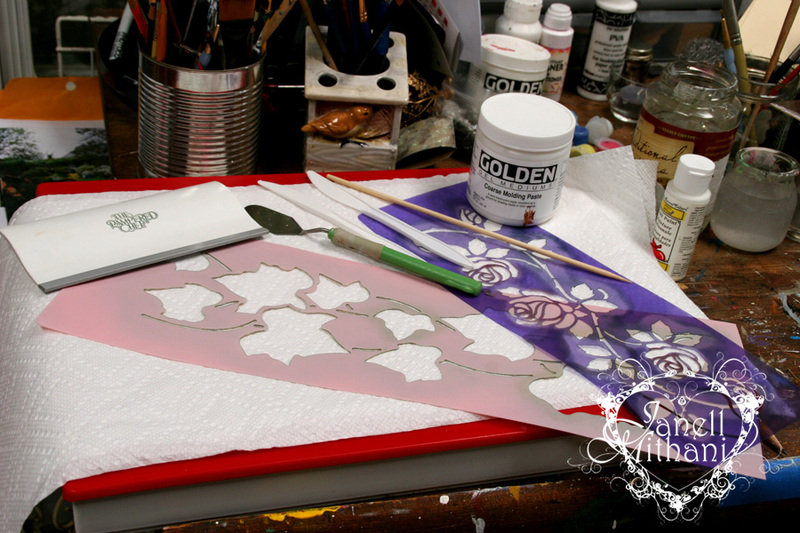 More texture added to the flowers with Golden Coarse Molding Paste added to the acrylic paint. Another stencil application in the lower left corner of the canvas. 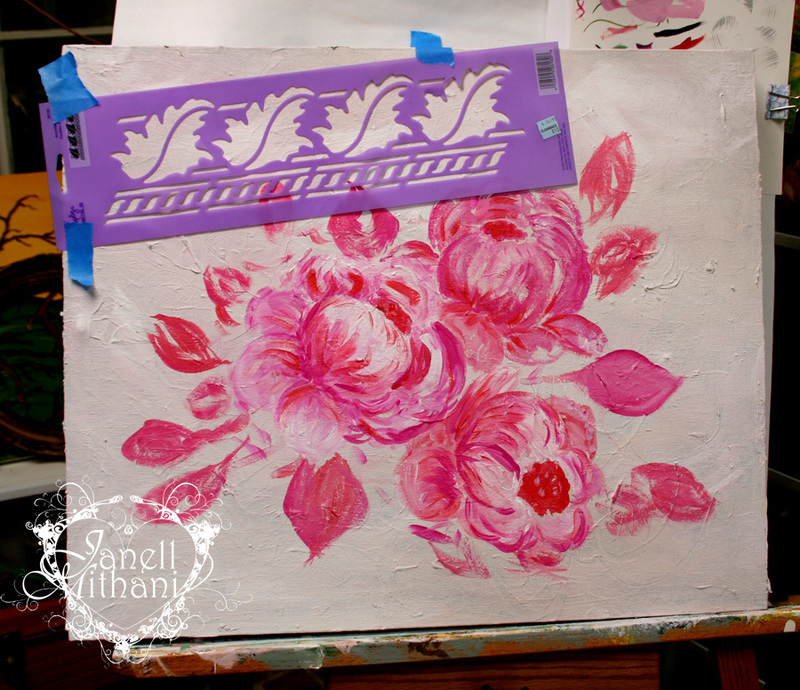 Once I lifted off the stencil, I went in and added more lines with my palette knife while the paste was still wet. Here is the final painting again. I hope you enjoyed seeing my creative process. 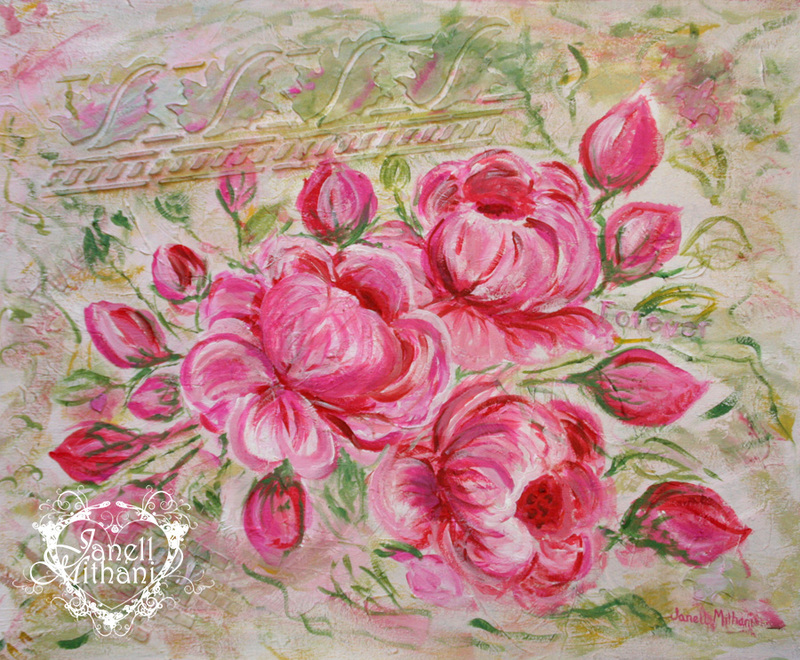 This entry was posted in Janell's Artwork and tagged art tutorial, flower, how to, mixed media painting, mixed media texture, Roses. Bookmark the permalink. Beautiful! I love how you did this. Such nice texture! Thanks. And thanks for stopping by my blog. Wow, this is amazing! Thank you for sharing the technique!! Thanks for the excellent tutorial! So nice of you to share your process! Whoa! 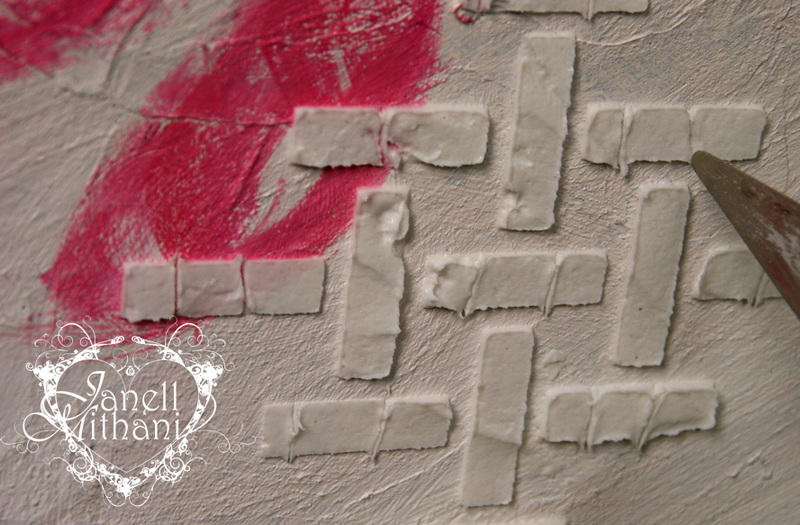 I’ve been thinking about putting more texture in my work – now I have a better idea of how to go about this. Thank you for stopping by my blog! Your explanation of the use of this has been a real inspiration – and a great timesaver as I now know where to start. Thanks for the follow. This is awesome, will visit more. This is wonderful, Janell! Thank you for sharing the process with us! Carolina, Thank you! I am excited about opening my shop. Just can’t believe how long it is taking me to post each listing. Hopefully, I will get faster at it soon! Oh you’re not alone that’s part of the process it take time for me too.. Thank you for taking the time to look at my blog.